The Rail Fence quilt pattern has been a favorite of quilters for decades. Translated into a cross stitch quilt pattern, it is reminiscent of a cozy night by the fire place. 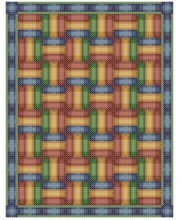 Featuring a warm antique color palette, this pattern is sure to be a pleasure to stitch.